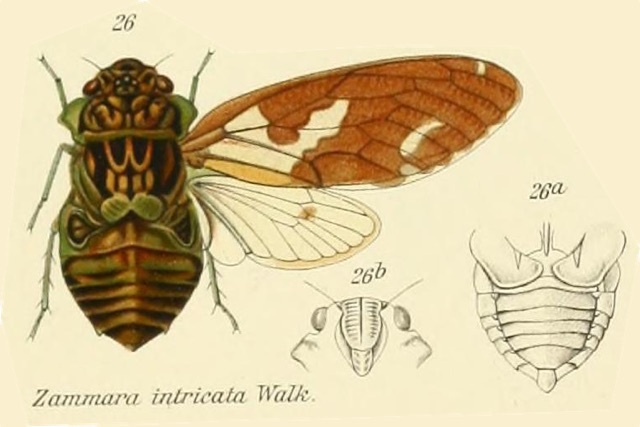 Zammara intricata Walker, 1850 (in case you’re wondering “Walker” is the person who first described this cicada, and 1850 was the year he described it) is another beautiful cicada belonging to the Zammara genus. Zammara cicadas are known for their prominent pronotal collars that inspire thoughts of Dracula the vampire, their brilliant green to turquoise colors, and infuscation (the dark areas) on their wings. Zammara intricata has a lot of infuscation in their wings, even for a Zammara. Intricata means “complex”, which might be a reference to the complexity of the infuscation. It is found in Puerto Rico. Characters. — Head (including eyes) about as wide as base of mesonotum, ocelli farther removed from eyes than from each other, eyes prominent but scarcely projecting beyond the anterior pronotal angles, vertex strongly depressed before base of front; face longer than broad, narrowly sulcate; pronotum shorter than mesonotum, the lateral margins angularly ampliate; mesonotum about as long as head and pronotum together; metanotum exposed; abdomen short; tympanal coverings outwardly complete, the orifices very widely exposed internall} – ; opercula short, oblique; rostrum reaching or slightly passing the posterior coxae; tegmina usually three times as long as broad, apical areas eight; wings with six apical areas.